EU superhero, Captain Euro®, being relaunched to respond to the rise of Euroscepticism, and keep Europe united with a strong identity! New stories include Captain Euro® dealing with global issues and politicians including Barack Obama, Angela Merkel, Matteo Renzi, new European Commission President Juncker, Vladimir Putin and David Cameron, among others. 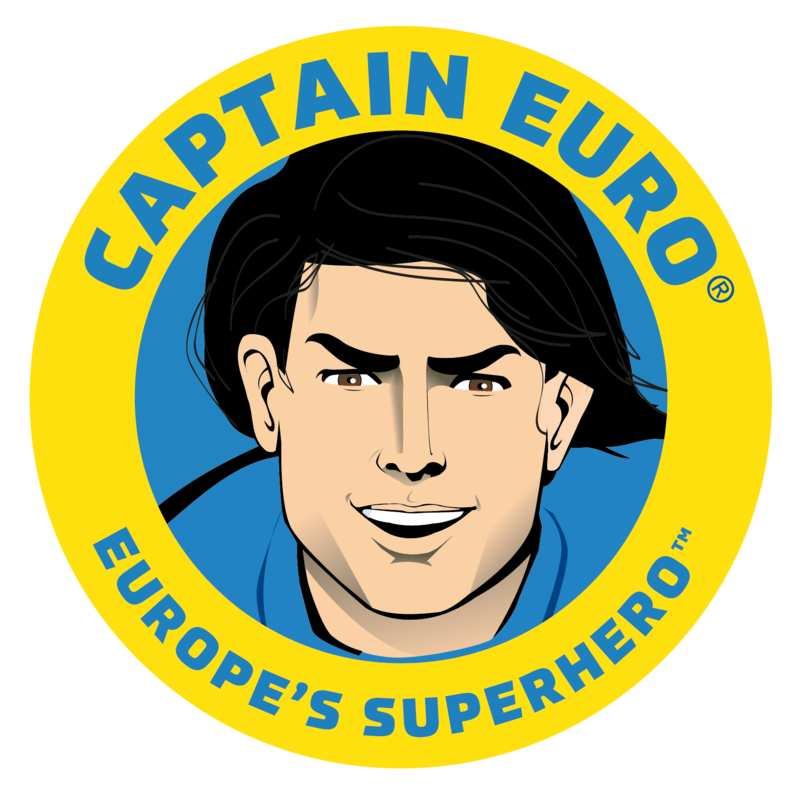 Captain Euro® is the controversial superhero mascot of Europe that became an instant media sensation in the 1990s. He was the first cartoon superhero representing the European Union, and is being relaunched today with a brand new website, new stories, cartoon strips, vignettes, podcasts, and much, much more! Captain Euro®, whether you love him or hate him, has never stopped receiving global media attention, and his character and storylines have been updated to reflect the present state of globalisation and the needs of a modern EU. To reach, entertain and inform as wide an audience as possible, Captain Euro’s stories and vignettes will also be translated into different European languages. Europe’s recent rise of Euroscepticism, and the lack of a strong and clear EU brand have shown the critical need to bring Europe closer to its citizens. Captain Euro® is being relaunched as part of the BRAND EU® Centre, the new independent initiative to develop a strong brand and identity for the people of the European Union. 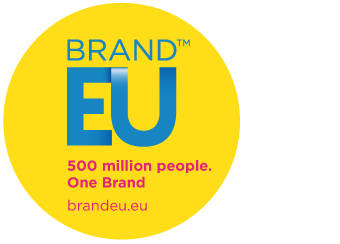 Managed by global business strategy think tank Gold Mercury International, the joint mission of the BRAND EU® Centre and their trusty protector Captain Euro® – is to assist in the creation of a powerful EU BRAND identity that connects with citizens and the rest of the world. 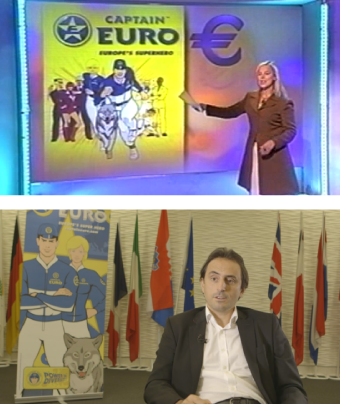 Captain Euro® was originally launched back in the 1990s to help launch the Euro, and solve Europe’s lack of clear identity. It created instant public impact, appearing on the cover of the Wall Street Journal, Time magazine, The Times, BBC, The Sun, CNN and news channels around the world. He was a divisive and exciting figure who is still talked about today! – Nicolas De Santis, President of Gold Mercury International, and creator of Captain Euro. With Captain Euro’s relaunch comes an entirely new approach and audience. 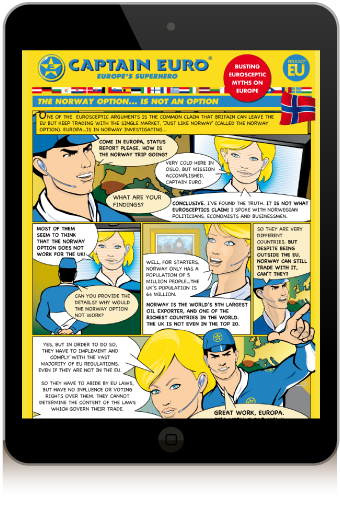 The new Captain Euro® uses the power of satire, humour, and intrigue to raise awareness of critical global issues. He is also tasked with exposing and criticizing areas which lack effective global governance, or systems with excess bureaucracy; particularly in the context of contemporary national, European and global politics. These new stories include Captain Euro dealing with global issues and world leaders including Barack Obama, Angela Merkel, Matteo Renzi, new European Commission President Juncker, Vladimir Putin and David Cameron, among others. When world leaders want advice and wisdom about EU and global affairs, they come to Captain Euro®. Captain Euro is supported by his crack team, assembled from around Europe, including Europa (an environmentalist, his oldest friend and greatest ally), Marcus (the programming genius), Helen (the governance expert), Erik (the tech specialist), Lupo (a rescued timber wolf and loyal friend to Captain Euro) and Pythagoras, the flamboyant and competitive Artificial Intelligence (AI) construct. Together, the team fights their eternal nemesis, the evil speculator Dr. Dexter Viderus (who goes by the villainous name Dr. D. Vider), who will stop at nothing to divide and destroy Europe for his own personal gain. Captain Euro and his team operate from diverse secret bases located in iconic European buildings, such as the Eiffel Tower (Paris), the Atomium Building (Brussels), the Colosseum (Rome) or Big Ben in London. He promotes non-violence and does not have any special powers, if we exclude his near-superhuman powers of persuasion and ability with languages. He uses the power of the intellect, strategy and common sense to solve humanity’s problems and defeat Europe’s adversaries. - Nicolas De Santis, President of Gold Mercury International, and creator of Captain Euro.